On Mother’s Day, Sunday, May 10th, we honor the grace, wisdom, and strength of all of our mothers, and all women that have made a difference in a child’s life. I encourage you to take this day to celebrate the extraordinary contributions mothers make in the lives of their children and their families. Now that we are drawing to a close this week, only one legislative week remains before the end of session. One bill on its way to the governor’s desk this week would protect Missourians from some municipalities that have exhibited predatory practices to raise revenue through excessive traffic tickets. The bill approved by the House and Senate is designed to shut down “speed traps” by limiting the amount of revenue municipalities can generate from traffic violations. Also, legislation meant to give kids in struggling schools more options to obtain a quality education is now on its way to the governor. The House and Senate this week approved a compromise version of what has commonly been referred to as the school transfer bill. The House also approved legislation Wednesday that would allow elderly and disabled Missourians to possess more assets and still qualify for Medicaid. Current law allows an individual to have only $1,000 in assets to qualify for Medicaid assistance. A married couple has an asset limit of $2,000. The bill approved by the House would steadily increase these limits to $5,000 for an individual and $10,000 for a couple by 2020. After that, the limits would continue to increase with the rate of inflation. Court Reform Final Approval One bill on its way to the governor’s desk this week would protect Missourians from some municipalities that have exhibited predatory practices to raise revenue through excessive traffic tickets. The bill approved by the House and Senate is designed to shut down “speed traps” by limiting the amount of revenue municipalities can generate from traffic violations. The plan that is now just a signature from the governor away from becoming law would limit the amount of revenue municipalities can generate from traffic tickets to 20 percent, which is down from the current limit of 30 percent. The bill further limits municipalities in St. Louis County, which has been plagued by excessive traffic violations, so that only 12.5 percent of their total revenue can be derived from traffic tickets. The bill also creates additional protections for Missourians by ending the process of courts issuing failure to appear charges against defendants for missing court dates on minor traffic violations. The bill also would prevent courts from ordering jail time for individuals who fail to pay traffic fines. In addition, the bill includes provisions to ensure accountability from municipalities in St. Louis County by requiring they meet minimum standards – police services, balanced budget, insurance, etc. – or possibly be dissolved. At its core, the transfer bill is meant to clarify and improve an existing state law that allows kids to transfer from poor-performing schools to better-performing ones. The law has created a great deal of financial hardship for unaccredited districts such as Normandy, which has been forced to pick up the tab for hundreds of kids who have transferred into surrounding districts. Protect receiving districts from being overwhelmed by transferring students by allowing them to establish policies regarding classroom size and student-teacher ratio. Supporters of the bill acknowledged that the plan doesn’t represent a perfect solution for the thousands of young people in poor-performing schools, but argued that it does provide a pathway forward for kids to receive the educational opportunities they need and deserve. They also pointed to the need to address the problem now rather than pass it along for future legislatures to solve. Opponents of the idea took issue with the lack of a tuition cap to keep costs in check for sending schools. They also expressed concerns regarding the expansion of charter schools, and the virtual school option, which they said would be run by a private company rather than by the public school system. The legislation now moves to the governor’s desk. The governor has already said he is unsure if he will sign or veto the bill, but indicated that he would give it a deep and thorough review before taking action. The House approved legislation Wednesday that would allow elderly and disabled Missourians to possess more assets and still qualify for Medicaid. Current law allows an individual to have only $1,000 in assets to qualify for Medicaid assistance. A married couple has an asset limit of $2,000. The bill approved by the House would steadily increase these limits to $5,000 for an individual and $10,000 for a couple by 2020. After that, the limits would continue to increase with the rate of inflation. 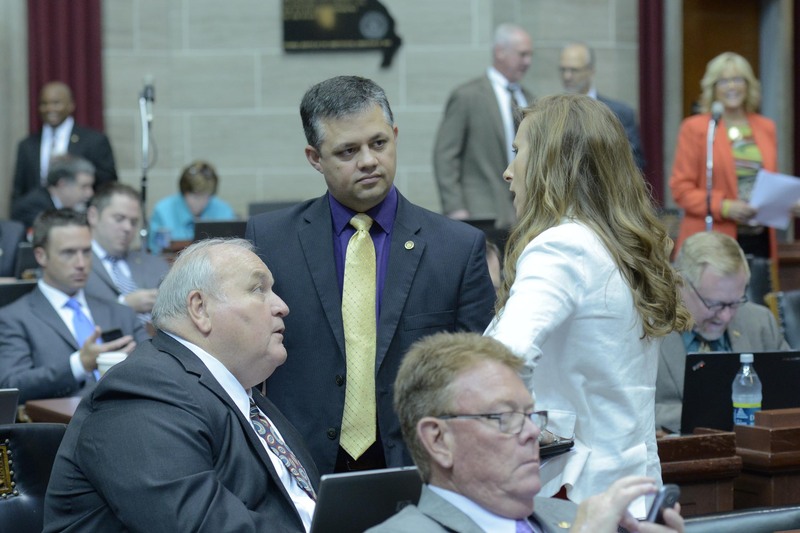 The bill received strong bipartisan support on the floor where the sponsor noted that Missouri’s assets limits haven’t changed since 1968. Supporters said the current limits prevent some of Missouri’s most vulnerable citizens from having enough in savings to adequately provide for themselves, or pay for things like emergency car or home repairs. The bill now appears headed for a conference committee where selected members from the House and Senate will negotiate a final version of the bill. “Payments in Lieu of Taxes” (PILT) is a program under the U.S. Department of the Interior where federal payments are made to local governments that are supposed to help offset the losses in property taxes due to non-taxable Federal lands within a state’s boundaries. Missouri, however, does not receive nearly the amount of revenue from federally-owned land that it does compared to privately-owned land. This is simply unfair to local property owners and swindles local governments out of vital revenue. In fact, the Federal Government pays about 1/10th the payment on the land they own within Missouri in comparison to what private individuals pay. In Crawford County, Federal payments totaled approximately $80,687 on 49,719 acres of land. In Phelps County, Federal payments totaled $107,859 on 62,831 acres of land. The total loss in revenue for both of these counties is over two million dollars. As a result, local property taxes have to be increased to compensate for the tax breaks given to the Federal Government under the current PILT system. Again, I believe this is grossly unfair and should be changed immediately to a more fair, average property tax rate by state. Land owned by the Department of Conservation should also be included in this new average tax rate system of payment. I urge you to contact your U.S. Congressmen and Senators and urge them to revise the PILT system. I am honored that by first bill, House Bill 179, which allows a retired military member to provide a Veterans’ Identification Card issued by the United States Department of Veterans Affairs in order to receive a veteran designation on his or her driver’s license was ‘Truly Agreed To and Finally Passed” this week. This is my first bill that is set to become law and I thankful to have had the opportunity to help our veterans across the state. Also, HB 1216, which designates the State Highway 19 bridge over the Meramec River between the cities of Cuba and Steelville as the “Betty Vickers Memorial Bridge” was amended on to Senate Bill 156 and was also “Truly Agreed To & Finally Passed” this week. Mrs. Vickers was an outstanding woman, mother, and citizen and I am grateful to have been able to honor the Vickers family with this well-deserved designation. 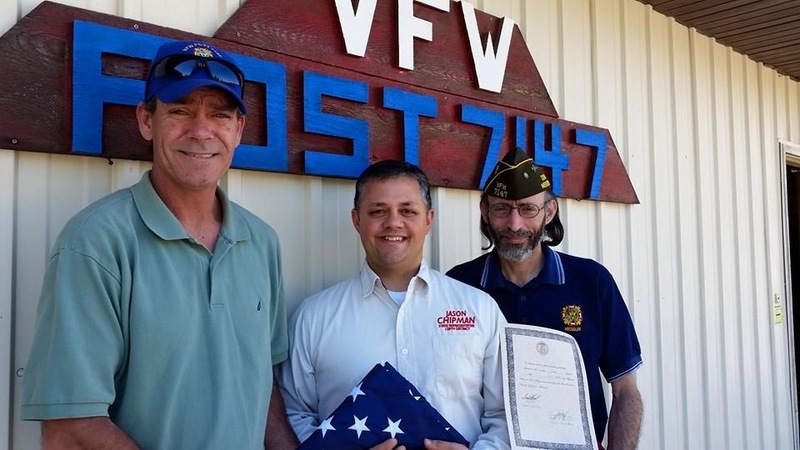 I was honored to present an American flag that flew over the State Capitol to VFW Post 7147 in Cuba last week. Thank you for doing all that you do for our veterans. I was very proud to present a resolution to Mr. Jeff Tolly, a science teacher and long-time athletic director at Steelville High School. 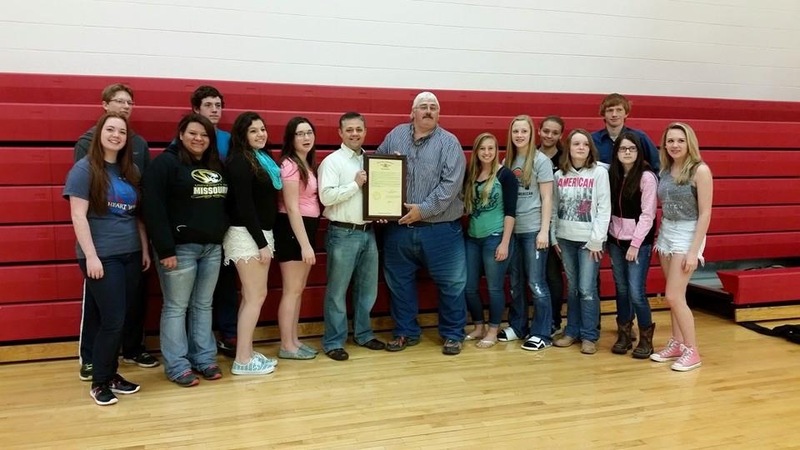 Mr. Tolly has served the students of this state with distinction for 29 years. He also had the immense honor of putting up with me for 4 years. Thank you and congratulations on your upcoming retirement. 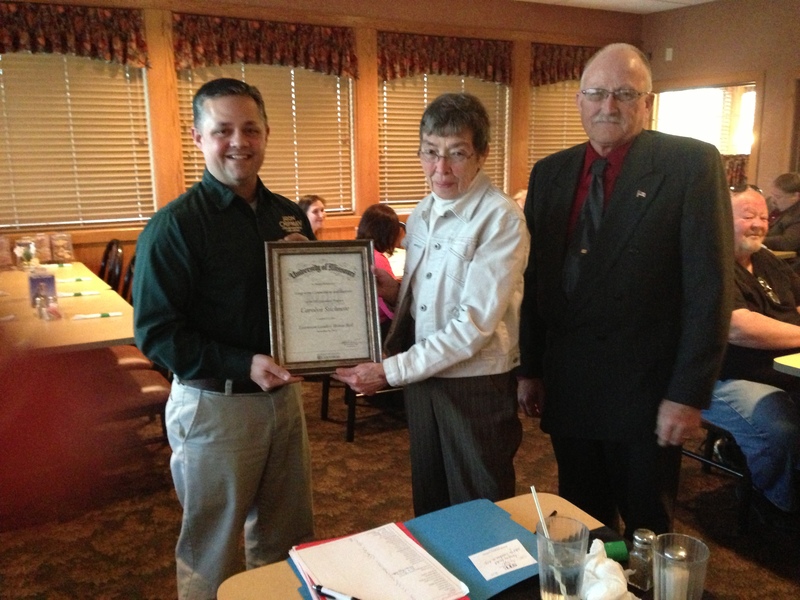 I was also honored to attend the 2015 Crawford County Extension Council Banquet in Cuba, MO. I was able to help present several awards and give a legislative update on key issues affecting the state. Dillard Town Picnic—May 9th 10 AM to 4 PM The public is invited to experience an early 1900s picnic at one of Missouri’s most scenic state historic sites. Sponsored by Missouri State Parks, the annual Dillard Days Picnic will be held on Saturday, May 9, at Dillard Mill State Historic Site near Davisville. This is a free event will be from 10 AM to 4 PM. Kid’s Free Fishing Day—Saturday, May 16t, Maramec Spring Park. This annual event, in cooperation with the James Foundation and other local organizations, is sponsored by the Missouri Department of Conservation. A heavily stocked “Kid’s Only” fishing zone will be designated for the daylong event. Fishing begins at 6:30 a.m. and will conclude at 8:30 p.m. Many hands-on activities and contests relating to fishing will be will be held throughout the day near the Kid’s Only zone. For more information call Maramec Spring at 573-265-7387 or the MDC Hatchery Office at 573-265-7801. Come early and stay late for this exciting, fun filled event at Maramec Spring Park. Electronic Waste and Tire Collection—May 30th 8 AM to NOON at the Rolla Campus. By working with the City of Rolla, the Ozark Rivers Solid Waste Management District, the Missouri Department of Natural Resources, the Meramec Regional Planning Commission, and the Phelps County Commission, Brewer Science provides area residents with community collections that have enabled Phelps County to properly dispose of almost 811,000 pounds of waste over the past 11 years. This partnership has contracted disposal companies and provided volunteers who collected appliances, electronics, and tires from area residents, which would have otherwise been disposed of in a landfill. Brewer Science continues to support these efforts and will host an annual Electronic Waste and Tire Collection on May 30, 2015, from 8 am to noon at the Rolla Campus. State General Tax Collections Per Capita range from $2,108 in Hawaii to $446 in Colorado. Missouri is near the lowest at $523. This entry was posted in Government and tagged capitol, chipman, jason, report on May 7, 2015 by Representative Jason Chipman.